A Sucker For “The Greatest Movie Ever Sold”? A couple of nights ago my wife and a friend of our s were at the house preparing for an early morning departure to our favorite Thanksgiving destination: somebody else’s rental house snuggled on a sleepy section of the gulf coast of Florida. Rather, it would be more accurate to say that this friend of ours and I had finished all productive preparation and were camped out in the living room trying to figure out what to do with ourselves while my wife (after just finishing a day of dealing with the new yard guy, the “seal our attic from flying squirrels-guy”, the house-sitter and last-minute grocery shopping) had just started her own packing while attempting to transfer a 7 disc Charles Mingus compilation into a vehicle-ready format. I had resisted this one for a bit, even though I have a soft spot in my heart for both the rogue sociological experimentation stylings of Mr. Spurlock as well as any sort of documented commentary on consumer culture. Perhaps I was afraid of awakening too many demons. In any case, I ought not to have been so skiddish. At first I was concerned that the intent was to make out the industry as evil and make fun of those sponsors who would be stupid enough to fall prey to what I presumed was some form of subversive trickery. Then I thought – Is the joke on the viewer? Are we being tricked into buying products we would never normally have purchased until seeing them in this movie? Will the next documentary be about us? I was actually both entertained and impressed by the tenor and content of the film. The premise was entirely objective: Mr. Spurlock wanted to make a documentary about product placement and branded entertainment by creating a film that was funded entirely by product placement and branded sponsors – whilst capturing the entire process as the content of the film. The treatment was entirely respectful of both viewer and its willing brand and agency partners – who bravely allowed Morgan into their war rooms and handed over budgets for the opportunity to bear their guts to the public while at the same time hoping to generate enough media impressions to drive a lift in sales. All the while we were able to both appreciate the effort and enjoy the candor with tongue firmly planted in cheek. The truth of the matter is, we live in a branded world. But we built our own cage where consumer culture is concerned. On the one hand, there are enough choices out there that we can be choosy and try to find those products and brands who’s offerings and ideals match up to our needs and social dispositions. On the other hand, it would be nice to put consumerism in its place every now and then – at least just long enough to sit and be entertained without the subliminal burden of being sold. For example, Spurlock devoted several minutes of film in his production to a show and tell of how, for the last several years, Sao Paulo Brazil has existed with an all out ban of outdoor advertising. No billboards. No signage on buildings. No ads on cabs or buses. Period. The only thing you see on the walls outdoors is art or, well, walls. It gives you an opportunity to notice things like the architecture and trees and other humans. The people of the city have responded with overwhelming approval and appreciation year after year as they enjoy the reach urban beauty of this city that had been previously hidden. 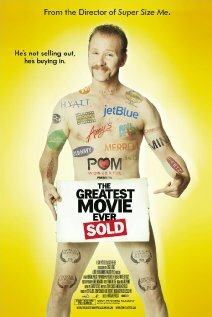 So hats off to Mr. Spurlock and his ironic parade of brands in this very informative movie. I would also like to let him know that, for the entire trip, this friend of mine (not me, I swear, because I am immune to brand placement. 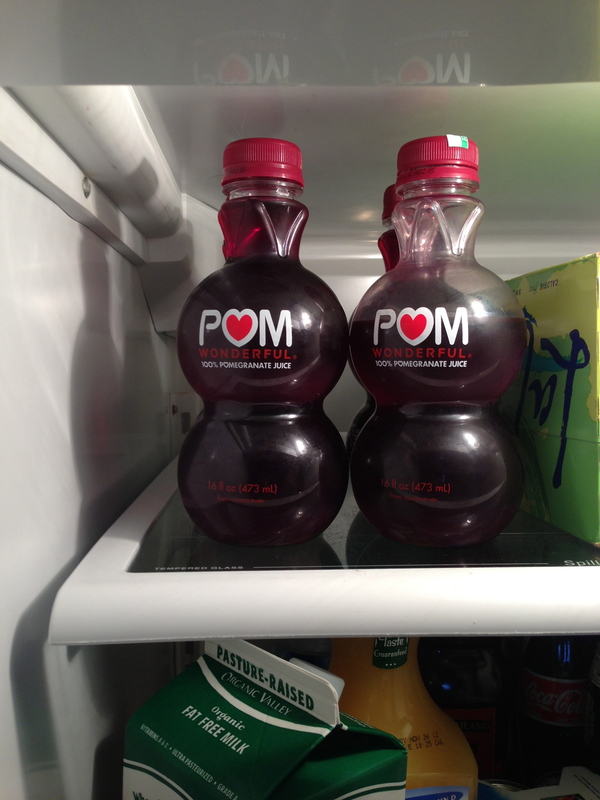 😉 ), could not only NOT get his mind of the fact that he really wanted to try some Pom Wonderful pomegranate juice, but he checked every convenience store we stopped in on the way to the beach. Suffice to say, he was thrilled to find it at the Piggly Wiggly (and I was equally shocked) and stocked right up. This is what the top shelf of our beach house refrigerator looks like…there are 6 six-dollar bottles lined up right there. So I suppose I also owe congratulations to the folks at Pom Wonderful. They reached our hearts and our wallets and will ultimately make it into my next cocktail. Cheers to product placement! And for the record, the impressions they get for this blog are free. All 3 of them.